Submit your FAFSA or the Dream Application for the next academic year. March 2nd is the priority deadline for undergraduate students to submit a financial aid application. This deadline is important to be considered for all types of aid administered by UC Santa Cruz. You must be a California resident to be considered for institutional grant programs. If you are a California resident and a new Cal Grant applicant, you must also submit the GPA Verification Form to the California Student Aid Commission by March 2. New undergraduate students admitted to fall quarter who submit a FAFSA or Dream Application will receive a conditional aid offer. The conditional aid offer is based on data provided on your financial aid application. The more accurate the data is, the more accurate the aid estimate. If the information provided on your financial aid application has errors, we will notify you and post instructions for resolving the problems on your MyUCSC To Do List. Take action to resolve any errors on your financial aid application as quickly as possible. The conditional aid offer is subject to change if the information on your application is incorrect, incomplete or doesn't accurately reflect your family’s ability to contribute. This is the priority deadline for fall aid applicants to submit documents on their MyUCSC To Do List. 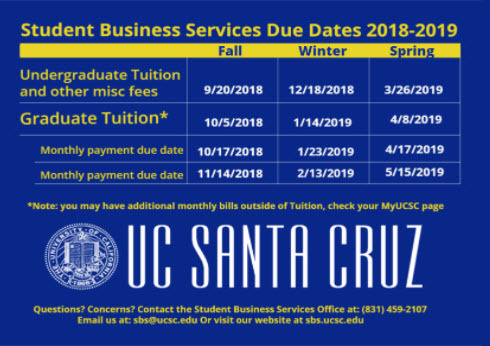 Documents must be received in the UCSC Financial Aid and Scholarship Office by this date (or by the date listed on the request) to be considered for all types of aid administered by UC Santa Cruz. Note: graduate students are not subject to this deadline and only California residents are considered for institutional grant programs. Students who submit a financial aid application and all items requested by the Financial Aid and Scholarship Office on their MyUCSC To Do List, will receive an e-mail when an official financial aid offer is ready to review on MyUCSC. Admitted students who accept their admission offer will receive an official aid offer after they accept their offer of admission. Fall quarter bills are posted. After you accept an aid offer, you may use our Payment Estimator to estimate how much you will owe for the quarter. First time borrowers must complete the loan promissory note and entrance counseling for the loan they wish to take out before funds will credit their student accounts. See Important Next Steps. Financial aid is posted to student bills on the schedule below. You will not accrue late fees if your aid disburses on time and covers your entire bill. If your aid does not cover your bill, subtract your pending/anticipated aid from the amount you owe and pay the difference by the fee due date. Note: Financial Aid funds cannot be applied to prior academic year charges. Students must pay charges billed in prior academic years independently from the financial aid disbursement processes.